PHOTO: Pictured here are the 2015/2016 Underclassmen Award Winners. Back left to Right: Business Partner- Brendan Moran (Beard Legal Group),Trevor Butler (Attendance), Patrick McCauley (STEM), Noah Detwiler (Academic Improvement), and Business Partner- Brian Irwin (Irwin Financial). Front L to R: Josh Allison (Attendance & Community Service), Cassandra Michelone (Community Service), Aspen Smith (STEM), Cassidy Bowmaster (Academic Excellence), Michaela Wilt (Academic Improvement), Olivia England (Academic Excellence). 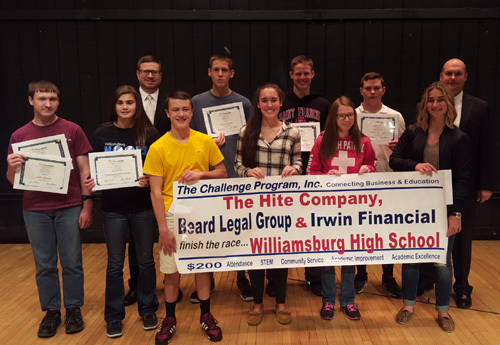 Williamsburg, PA -- To kick-off the 2016/2017 Program year, students from Williamsburg High School were recently introduced to The Challenge Program, Inc. during an orientation assembly at their school. The assembly theme was an Olympic trial that demonstrated the interview screening process to help students Qualify for Success. During the assembly, students in the sophomore, junior, and senior classes were introduced to local career opportunities from The Hite Company, Irwin Financial, Inc., and Beard Legal Group, P.C. Throughout the year, they will be eligible to compete for financial awards in five areas linked with academic and workplace success: Attendance, Academic Improvement, Academic Excellence, STEM (science, technology, engineering, math) and Community Service. The school's business partners for the 2016-2017 school year are The Hite Company, Irwin Financial, Inc., and Beard Legal Group, P.C.